DIAGNOcam is a transillumination diagnostic device that helps find and monitor interproximal caries and crack lines. I have found it very effective at revealing fracture lines. I use it as an adjunct to bitewing radiographs. 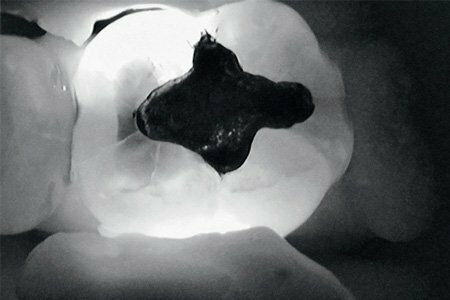 The DIAGNOcam is used to shine a light through both sides of the tooth and record the image. It can be used as an alternative to bitewings for patients who are pregnant, prone to gagging and children. Areas of concern can be monitored at shorter intervals than bitewings as there’s no radiation exposure. The DIAGNOcam will certainly pick up problems that can’t be seen with just a visual check. You’re usually going to see an interproximal cavity sooner with the DIAGNOcam than with a bitewing, but using them in conjunction with each other really assists in monitoring and assessing interproximal areas. It’s also a great visual aid in showing patients problems with their teeth. This helps with treatment acceptance and often motivates patients to improve their oral hygiene. Cracks also show up really well and it can be helpful in assessing the extent of fracture lines. In my practice, the DIAGNOcam is mostly used by our oral health therapists. I then have a look at the images they have recorded and decide if further action is required. This is a very good piece of equipment—it’s comfortable for patients and it works well. It would be great if it could quantify results with a number—like the DIAGNOdent—but that would probably rely on an advance in technology.